I am sure you have heard of the monthly box craze with popular options such as Birch Box, Yellow Box, Makeup Monthly, PopSugar and Crave Box and countless others. 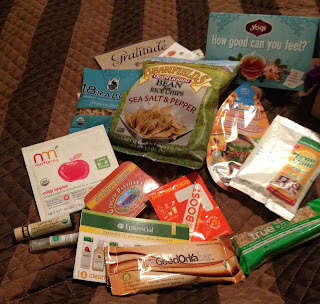 My sweet husband got me a subscription to Conscious Box for Christmas and I love it! Each company has their own particular details, but the concept is simple-you pay a monthly fee and have a “grab bag” of items shipped to you. Some items are full size, some are samples and there is usually a really nice variety so you can try out lots of different products. I researched and tried some other food & fitness related boxes, but I settled on Conscious Box because of the minimally processed and organic items I receive, they also have Vegan and Gluten Free boxes if you are interested. Here’s the description from their website: Conscious Box brings healthy, organic, sustainable, and purpose-driven businesses right to your door. What's inside your Conscious Box changes every month, with 10-20 products that are certified organic, fair trade, vegan, cruelty free, or more. Only most socially responsible companies are included—so you can be sure they're putting people & the planet first! Conscious Box is great way to discover new businesses that are committed to the philosophy of sustainability, conservation, and social responsibility. I love this concept because I wouldn’t necessarily buy all of these products in the store, but it’s a great way to try lots of different things and then go purchase them if you like them. And if you don’t, then you won’t feel bad about wasting money since there are at least 10 other items in your box. In December I really liked the 7th Heaven Naturals face mask. I was able to get 2 uses out of it and left my skin feeling refreshed. I also enjoyed the 18 Rabbits Granola with crunchy pecans, almonds, maple, and just a hint of coconut. And I tried the Beanfield Snacks chips made out of Beans instead of potato’s. Crazy huh? Brian is hooked on the St. Claire's Organics Ginger Sweets. They were a little too intense for me, but I am glad he liked them. Avalon Organic’s Soothing Vanilla Rosemary Lip Balm is also a favorite. It’s not sticky and tastes and smells wonderful. And I loved the Divine Chocolate Spice Cookie Bar. We had to buy another one at Whole Foods since we devoured this one so quickly. My skin gets extra dry in the winter and the Eden Allure Argan Oil was a perfect way to keep it moisturized. In January I fell in love with the Qbel Whole Grain Crispy Wafers. I got mint but had to go and buy peanut butter & dark chocolate also. It was like a delicious and nutritious kitkat bar. I haven’t tried my Pamela’s Chocolate Brownie Mix yet, but it looks amazing! The Peeled Apple Clusters were a little too crunchy for me. 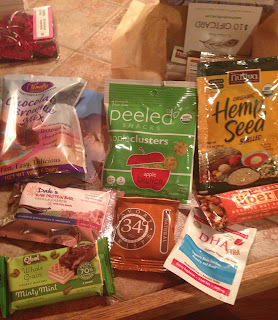 We both really liked the Teechia High Performance Super Seeds Cereal with Chia, Flax, Quinoa, Amaranth, Ramon and Pumpkin. It’s a perfect alternative for prepackaged oatmeal when camping. I also got a Larabar which I’m sure you have learned by now is one of my favorites! My February box will arrive soon, I can’t wait!